A very glamorous 1930s-inspired cane in black and gold, suitable for the most formal events yet robust enough for everyday use. 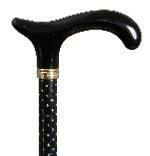 The cane features an elegantly shaped wooden derby handle, painted a glossy black. The top section of the shaft features a sealed fabric, patterned with glittering gold dots. The lower section of the shaft is plain, glossy black. The term 'glitterati' was coined in the 1930s to refer to the most beautiful and fashionable members of society. Fitted with a smart brass collar and a discreet non-slip black rubber ferrule, this cane is easily height-adjustable to a range of heights between 65cm - 89cm (approximately 25" - 35"), ensuring it will suit a wide range of users. Ferrule diameter 16mm.